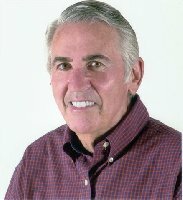 Richard Ellis, Class of 1953 , joins us from Weston, CT, and writes the following. Dear Alan: Good to hear from you. I appreciate the work you're doing on the web site. Would love to hear from any '53 classmates. After 8 years in the United States Air force living in Texas and Alaska, I settled in Las Vegas. I have been a radiolgist here for 27 years. Married for 38 years, 5 children ages 14 to 35. My mother owned Hattie's Dress Shop on Central Ave. from 1941 to 1958. If I come across any photos I'll send them along. Thanks to Richard for writing. Where on Central Avenue was Hattie's Dress Shop? I can't seem to remember it. Hope you can find some photos for the 50's section. Richard writes back to say the following. Dear Skip: Again thanks for all your efforts; you're doing a great job. Hattie's dress shop on Central Avenue was in Far Rockaway about a block from the library opposite the Columbia movie theatre. Florence Haas, Class of 1953, (Deceased) from Lake Worth, Florida sends this wonderful photo of her senior hat and writes the following. Thanks for including me in your research about Far Rockaway. I am a graduate of 1953. My sister Micke Haas was in class of 1962. Your idea to do Rockaway Beach reunion site is very nice. Sorry I can't help as I lived right in Far Rockaway near the Nassau County line not in Rockaway Beach. I have not been back to that area for almost 20 years. My sister lives in Cedarhurst but we transplanted to Connecticut & now we're in Lake Worth, Florida. There is a reunion being held down here in Boca on Saturday but none of my old friends who I still see down here are attending. Maybe???????? I'll get to New York for September's big party. I'm answering you via JUNO because AOL has become the biggest pain in the world. We can only get on in middle of the night. Best wishes to you and your plans. Thanks to Florence for writing. By calling this the Rockaway Beach Web Site, I meant to include all of the Rockaways from the Nassau County line to Rockaway Point and we certainly want to include you and any memories you would like to share. Florence writes again to let us know that her neighbor Stella (Block) Levitt, Class of 1937 from Lake Worth, Florida has checked out the web site and would like to hear from anyone out there who remembers her. She can be reached through Florence's e-mail address. I guess I'll have to open up a 1930's section. 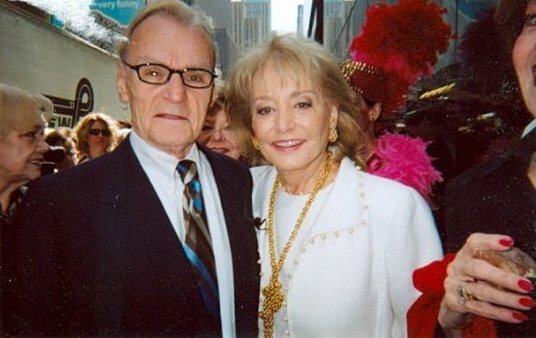 If Stella writes and sends along a few memories, I will be happy too. Great job Carol! I think that you should post this on the 1953 graduatates page. In case you did not know it, the class that graduated in Jan. 1953 was the last class to graduate in January. After that there were only June graduates. 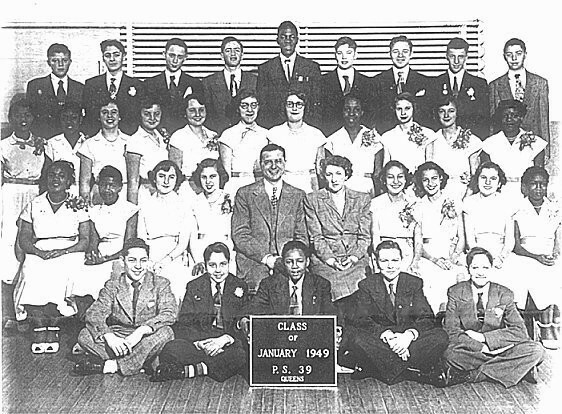 The class from P. S. 39 that graduated in June of 49 (F.R.H.S. graduating year would be 1953) already has their photo on that page, and this one will go good along with it. Thanks to Loretta (Grote) Di Ciglio who sent me the copy that I sent you. One of the LIRR Laurelton commuters. I look the same now as I do in the PS 39 photo, Class of '49, except I'm a little taller and my hair is white. Would like to hear from lookalikes. I am registering my dad. I'm sure he would love to hear from anyone who remembers him or his older brother Herby. They grew up on Beach 135th St. Graduated P.S. 42 (49) Arverne, lived B. 65th St., hang out Coffee Pot 67th St. Brothers Richard (Slick), John, sister Dolly married to Syd Wander. His father had barber shop 67th St. All went to FRHS. My father had kosher butcher shop Neponsit, 146th St. Married 38 yrs., business 35 yrs. Children Gary, Rhonda, Jeffery. Hope to hear from the old gang (Neptones). Been out here in Southern California since 1989. Married, 6 grandchildren. Love it out here. 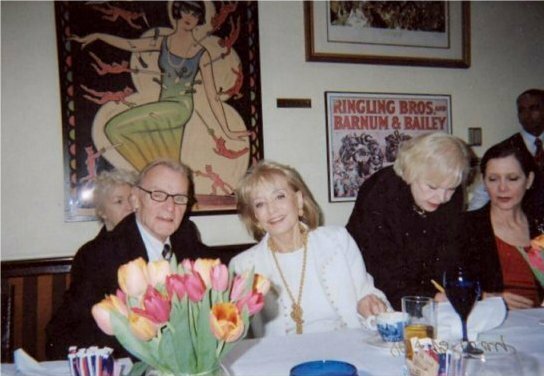 Friends with Jerry & Bev Auerbach. Jerry is also from Arverne, Class of 1950. I am wishing you a Merry Christmas and a Happy New Year this year from Slovakia where I have been living since the end of October. I have contracted to teach English for one year at a branch of the Canadian Language School located here in a town called Zilina. During the past summer, I earned a TEFL (Teaching English as a Foreign Language) certificate from an organization called Oxford Seminars which is based in California. It has been in my mind for many years to live abroad for awhile; the opportunity to accept a position in Slovakia came suddenly. It will be difficult to be apart from all of you, particularly those who are dearest and nearest to me, and I shall miss you. However, time goes by quickly; I shall be home again to enjoy the cheer, warmth and love of next Christmas following in no time at all. I am able to get along somewhat in Slovak since many words are similar to Czech, which I know. I am daunted by the prospect of having to learn yet another language. On the other hand, I have been fascinated with foreign languages since I was a child so in a way I am looking forward to the challenge of getting about town armed with some facility in Slovak. I am teaching a three-hour class in the mornings and three evening classes three times a week. My students are adults, ranging in age from twenty to forty-five years. It is quite demanding so far considering I am doing a lot of walking. I live in a village called Budatin in an apartment below a private home which is quite suitable. The apartment opens out on a garden with a path that flows down to a field behind which are railway tracks and then a hill behind covered with dark evergreens. The village rests across the Vah River which separates it from Zilina. I am enjoying the long walk down the very long street on which I live and then across the bridge into town. There is bus service along the way. My school is located near a busy promenade that opens onto one of the town’s squares dominated by a large, picturesque Catholic church located in the central part of town above the square. The weather was quite nasty in early November with continual rain and snow but it has warmed up again and we are all happy about that. The square is now decorated for Christmas and it delights me when I walk in the early dusk to the school and watch people wrapped up with heavy coats and scarves scurrying about and children with their mothers nearby riding a small train on a circular track set up temporarily which adds a touch of color and jollity to what may still be a somber inheritance of decades of socialism. With that pleasant vision in my head, I now wish you once again a very Merry Christmas and a Happy New Year. For my Jewish friends, a Happy Hannukah, and for everyone else, may you be of good cheer. "After practicing diagnostic radiology for 8 years in the US Air Force AND 30 years in Las Vegas, Nevada we decided to come back east and have retired to beautiful Weston, Connecticut. I have often thought about my days at Far Rockaway and the friends I made there. It was only recently, however, that I thought to look for a website and was delighted to find one! Among other things, who could ever forget the hours spent on the LIRR and the scent of the ocean as we left the train each morning. I'd love to hear from old friends to chat about the good old days. We were the fortunate few to be born in the thirties and therefore by just good luck never called to fight a war, but lived through the greatest time of America's coming of age. My good fortune led me to a Columbia education, then to several years in Paris with business and other travel throughout western Europe. Finally settled in the Boston area with my own business from which I am now retired. Brother Paul (Went to Stuyvesant) is in Virgina and older brother Herbert is quasi retired in NYC. I actually went to Stuyvesant HS in Manhattan, but since I grew up in Laurelton and all my friends and my two brothers (Herbert and Alan) went to FRHS I want to be included. They let us out 6 months early to catch the fall college semester. Bad move on my part as I didn't know anyone that I graduated with or anyone in the "Dolphin." I'm desperate to get a copy of the June 52 yearbook and the Jan 53 yearbook as I don't remember the names of most people. Any way you can help? Thank you. When my group (the four voices on Columbia records) broke up I needed a job. My friend Rip Taylor was appearing at the Latin Quarter, owned by Barbara’s dad Lou Walters. He got me an audition and I went to work as production singer at the club. It was a huge club that employed showgirls, dancers, singers and a host of big names including Sinatra. Some of my girls were on "The View" Halloween show. We have an alumni group from the quarter. Up until five years ago we were doing shows in New York City, proceeds to missing and abused children. Totally curious about classmates. Love to know if there are any in my area? Queens College BA in Psychology. New York Life Insurance Co. for 30 yrs. in New York and Los Angeles. Retired and moved to Palm Desert in 2001. Dear Skip, You & Carol have done a fantastic job creating & maintaining the Rockaway website. Keep up the good work; you are certainly keeping the spirit of FRHS alive. I, for one, greatly appreciate all the effort you & Carol have put into it. Best wishes for a Healthy, Happy & Successful 2001! I have recently "retired" and moved from Madison, Wisconsin to Boynton Beach, Floria. Can't believe the number of FRHS (and Arverne) "old" friends I have had the pleasure of seeing and communicating with, since I got here. I still do a bit of "consulting" in my field (I have been a Diabetes Educator for many years) and plan on sculpting and refinishing furniture as soon as I am settled in my new home. Would love to hear from anybody in the area who would like to get together. My brother, Burt, (graduated FRHS in '57) lives in Ft. Lauderdale and we see each other often. I have three children (Sharon, Dan and Michael) and 7 grandchildren. Have had an interesting life, lived in many places and traveled extensively. Through this site I had the opportunity to visit with a woman I had gone through grade school and high school with, as well as be in touch with a number of other people. What fun!!! Serendipity - love it. Found this site through Buzzy Hoffman and Zelda Dubin (neither of whom I have seen in over 35 years but who recently contacted me via e-mail). It is just great and I look forward to hearing from old friends and classmates. Perusing the Laurelton Web site at www.laureltonnewyork.net brought back a flood of memories and thoughts of what a wonderful place to live; a place and a time (40s and 50s) where a kid was able to bicycle anywhere even through a farm area, where the store keepers seem to know his name and where friends were all around. In a time of extremes and blue and red politics it's a pleasure to go back to such a place, even for a short time and only in your mind. I'd love to hear from like members of the Laurelton "memories club." Hope to hear from former classmates/teachers circa 1953. Looking for Patricia and Louise Merz 53, Lucy Sobel, Gail Litt, Semina Litman (roller skating buddy)'53. I went to public school, and James Monroe HS (freshman) in The Bronx with the Merz girls. We all lived in Classon Point, and met again in FRHS before graduation. Get in touch with me. Hi Skip, What a great job. I graduated in '53 and was active with the Chat. Loved Far Rock. 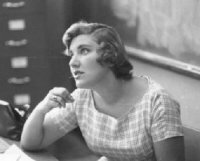 Came back in '62 and taught English for two years as Lydia Kaufman. Loved the class of "63..Machlis, Steinberg, Dillon,Georges,etc. Spent 20 years as school superintendent in PA and Shelter Island, NY. Am married, have beautiful his, hers, and ours kids (7 in all) and tons of grandkids. Live in Delray, FL. and would love to hear from peers and students. P.S. I'm the mystery teacher. Looking for anyone living in Manhattan. Enjoying retirement, doing lots of fishing, and playing lots of poker. I teach political science, philospphy and management. I have written a book on the way organizational life is portrayed in the movies. I have a horse ranch just north of the Napa Valley, where I live with my wife, Kit. 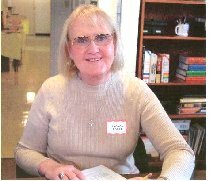 Kit is an author who has published three mystery novels.We provide riding experience and therapy for people with disabilities. I spent 30 years as a naval officer after graduating from the Naval Academy. I have a Ph.D. from the University of California at Berkeley and a Masters degree from Harvard University. I lived in the apartment house on Bch 36th Street. I'm looking for classmates and anyone in HMS Pinafore. Via Arizona, Halifax, Nova Scotia, Philadephia, Albany, NY, New York and Westfield, NJ I'm now the Director of Ambulatory Services at Miami Childrens Hospital, Coral Gables, Fl.. Practicing Academic Pediatric Endocrinology over the years. I've recently moved from Coconut Grove, FL to Fort Myers, FL, to a new position as Pediatric Endocrinologist at Lee Memorial Children's Hospital with Doctors for Kids (a pediatric subspecialty group). I just got on-line and would like to hear from some 1953 grads. Weisbaum, Elinor(Ellie)(Kaufman) - Nanakeddie@aol.com - Columbus, OH I would love to be in touch with some of the people I graduated with in l953. How they are doing, etc. 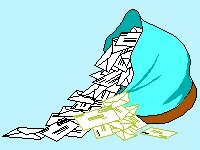 If they could e-mail me it would be great. Thanks again to all the talented and willing people who are keeping our contacts going. It's fun to be back in touch after all this time. Thanks to those making it possible.